Annabel Pitcher’s debut novel My Sister Lives on the Mantelpiece was one of my favourite reads of 2011 so I have been keenly anticipating her second novel, hoping that it would engage me and move me in a similar way. Well, it’s a very different type of novel but I’m delighted to report that it packs the same punch as its predecessor. The novel is composed of a series of letters written by a fifteen year old British girl and addressed to Stuart Harris, a prisoner on Death Row in Texas. Initially, she is cautious about revealing her identity and location, writing under the pseudonym “Zoe” and living in Fiction Road. Ironically “Zoe” feels that she and Stuart have something in common – he having murdered his wife and she feeling responsible for the death of a boy she knew. So she sneaks out to the garden shed at night, hoping to somehow exorcise her guilt by confessing to a stranger. We never hear directly from Stuart but there is quite enough going on in day to day life as well as “Zoe’s” gradual revelation of the events of the past year – May 1st is the first anniversary of the boy’s death. The author succeeds in weaving an intriguing tale of family relationships, the intensity of young love, the angst of the teenager as well as keeping the readers on the edge of their seats wondering who died and who is to blame. 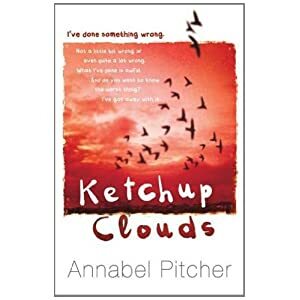 Annabel Pitcher has captured the teenage voice and tone perfectly in a very natural and easy way. All of the characters are fully fleshed and extremely credible from the bickering parents feeling the stress of financial worry and the pressure of caring for elderly parents to the precocious middle child who feels ever so slightly neglected. It all flows beautifully and even though I’m not usually a big fan of romance, I felt the strength and intensity of “Zoe”‘s emotions with a conclusion which moved me to tears. You’ll laugh and cry in equal measure and, if you’re slightly older like myself, you will breathe a blessed sigh of relief that you’re no longer a teenager. It certainly doesn’t look as if Annabel has suffered much from second novel syndrome as her writing is going from strength to strength, increasing in confidence, engaging you from the first word and keeping you enthralled – I’m already looking forward to her next novel! This entry was posted on Monday, October 29th, 2012 at 8:46 am	and is filed under Children's Books, YA Fiction. You can follow any responses to this entry through the RSS 2.0 feed. You can leave a response, or trackback from your own site. I enjoyed her debut novel so am looking forward to this one. It is reassuring to see you enjoyed this one so much. I hope the audio book is as good this time too. She’s a very talented writer, Jackie. I’ve read some YA books where the author just tries a smidgen too hard to capture the teen voice and they fail miserably – she seems to capture that angst perfectly.